Blondie and Brownie: CakeSpy's Tour de Sweet: Magic Cookie Bar Pie and Book Giveaway! 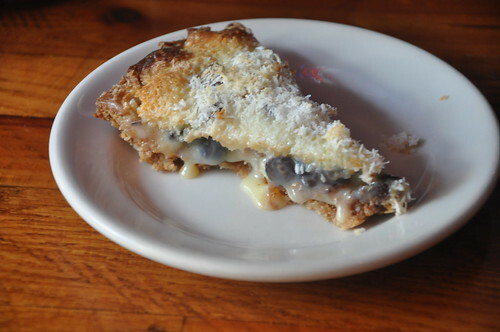 CakeSpy's Tour de Sweet: Magic Cookie Bar Pie and Book Giveaway! I first encountered Magic Squares in college. Sweet, chewy, and ooey-gooey, they were just the perfect fuel for late night study sessions. I've added crushed potato chips, pretzels, and chopped peanuts to make Kitchen Sink Bars, but it was the Head Spy herself, the fabulous Jessie Oleson, who opened my eyes to the possibilities of a Magic Bar Pie. As Jessie said in her new book, CakeSpy Presents Sweet Treats for a Sugar-Filled Life, "Magic Cookie Bars are, as their name might imply, no ordinary treat. Starting with layer upon layer of unrelentingly rich, buttery graham cracker crumbs, toasted coconut, chocolate and butterscotch chips, and nuts, they get even better when they’re smothered in rich sweetened condensed milk. With all that awesome, some might argue that a small serving is best. But I disagree, and to prove it, I’ve created those magical bars in pie form, which is naturally best served in thick, fat wedges. You’re welcome." CakeSpy's recipe includes brilliant addition of peanut butter in place of plain chopped nuts which ups the saltiness factor. As much as I love sweet treats, I tend to knock my magic bars down just a bit. Here I substituted unsweetened coconut for sweetened toasted coconut, upped the amount of chocolate chips and took down the amount of butterscotch chips. The result was ab-so-freaking-lute-ly delicious. Preheat the oven to 300 degrees F. Butter a 9-inch pie plate. press the mixture into the bottom and up the sides of the pie plate. the crust (think polka-dot pattern). then gently shake the pan to make sure the liquid has settled evenly. Scatter remaining coconut on top. Bake for 30 to 40 minutes, or until golden brown and bubbly. 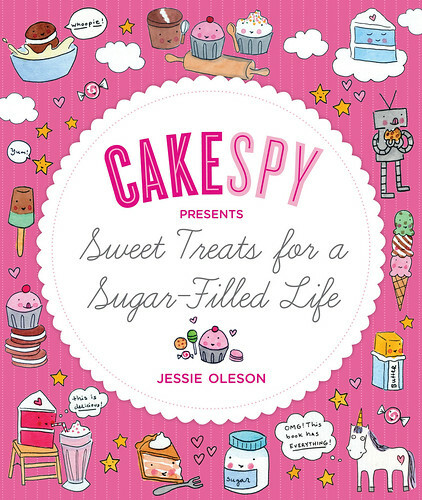 You can get this and 59 other amazing CakeSpy recipes in CakeSpy's book wherever books are sold. And thanks to Jessie's publisher, Sasquatch Books we have a copy of the book to giveaway. Leave us a comment with your thoughts on butterscotch chips, yay or nay? To double your chance at winning go like our Facebook Page and leave us a comment there, too. I'll pick a winner at random on Monday morning, so be sure to come back and check to see if you've won. Good luck! I LOVE butterscotch chips. If I use them in a recipe, I typically end up eating 1/4 of the bag before I even get to putting them in. Butterscotch chips are great! They always dress up cookie bars or pie and leave you with a surprising kick. I love them! butterscotch chips are a MUST! especially in bread budding, mmm! definitely yes to butterscotch chips. butterscotch anything really. yum! So funny because I baked with these recently and I realized I really don't like them at all! But my husband does, so oh, well. butterscotch chips are so yummy! Looks Interesting to me.I will try it. One of my favorite fall treats are pumpkin cookies with butterscotch chips, so tasty! Not a fan of the butterscotch chips, but I do love butterscotch pudding! Definitely a big YAY to all things butterscotch. This looks yum. I'm not a fan of butterscotch. Butterscotch chips compliment the chocolate and coconut perfectly! A definite yes! Aw man how did I miss that pie at Pie Party Live! Looks delicious and I DO love me some butterscotch. I think with the right recipe it's a great compliment. I made butterscotch maple cookies (original recipe) and it didn't overwhelm at all but served as a great added sweetness to the cookie. And the winner is...Kate @ FoodBabbles! Congrats, Kate! Email re: your book coming your way momentarily!